My role in Ground Up? Well, at the time (c. 1993-1994) I was part of Artists Cooperative, The (A.C., T.) an artist-run organization downtown. Gilda Snowden was a friend. I asked Gilda and Vince Carducci (who then edited Detroit Focus Quarterly) and a couple of others how they would go about starting a publication devoted to the Detroit art community, with no money. 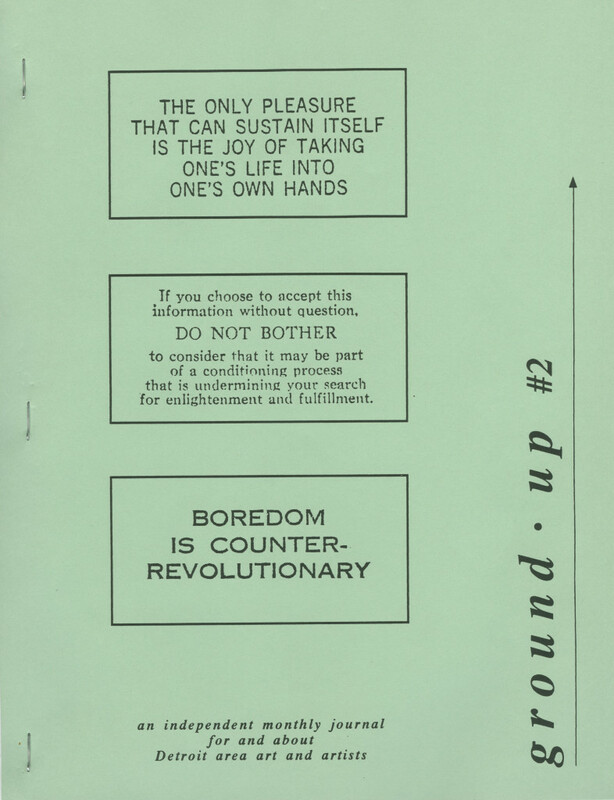 This was at the time that people were doing a lot of self-published zines, before there was really any such thing as a blog. I wasn’t computer savvy enough to figure out a blog on my own. 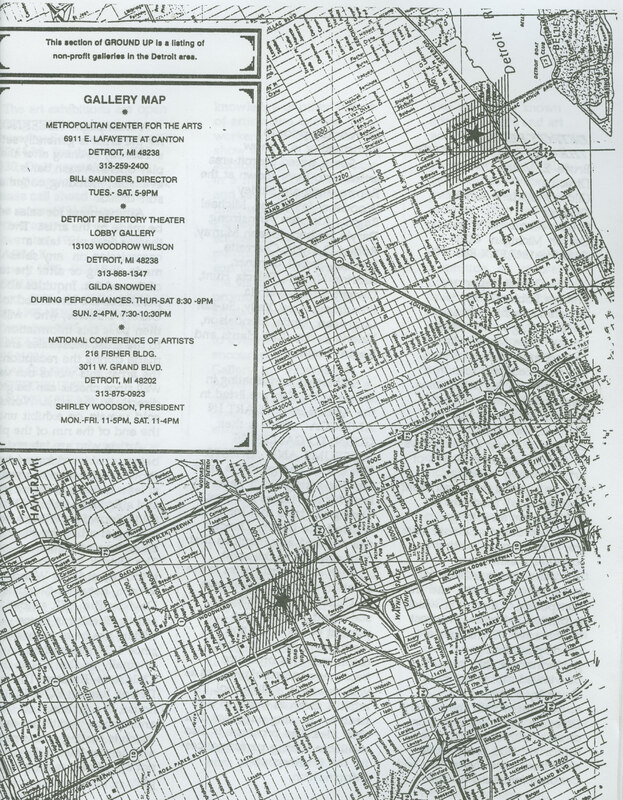 Gilda described small journals she had seen in New York and elsewhere where artists were taking it upon themselves to go look at gallery shows and review them. They’d make xerox copies of their reviews, compile them, and give them out for free in the galleries. We used this as a model. I chose the title Ground Up for the notion of “building from the ground up.” I put out a call to artist friends all over town, several people went out to write their own reviews of gallery shows, and we met to do a little what I will call “light editing” (egregious spelling and grammar problems were corrected, but we avoided “stepping on” each other’s writing). Then each writer made one hundred copies of their edited review, and we would meet to collate and staple them. I kept a list of galleries, art school libraries, and other sites that wanted to have them available. Every place where we left them agreed to make xerox copies for anyone who came in and asked for it. Over time, there were regular subscribers who would contribute enough cash to receive a copy in the mail. While I called myself the editor, it was a true volunteer effort on the part of a group of people among whom were contributors such as Jeanne Bieri, Kevin Castille, Dennis Nawrocki, Dolores Slowinski, Dale Sparage, Christine Welch, Richard Lewis, Sabrina Nelson, Peter Williams, Rose De Sloover, and others. Some wrote regularly, some, such every once in a while. We tried to be broad minded and equitable, but ultimately, the shows that got reviewed were the ones that had someone interested enough in the show to write about them. How do you make assignments to volunteer reviewers? I had a couple of simple rules I tried to stick to without fail: If someone wrote a review or other article that was not an obvious attack on another person, and related to some element of the Detroit visual art scene, and would provide the copies and help with the work, we would publish their review. If someone sent in a Letter to the Editor and was willing to sign their name to it, we would run it. It was a little tough to stick to these rules a couple of times. At the time, there were a couple of notorious cranks in town who considered themselves highly attuned critics. One of them especially could be quite offensive. But since he was willing to put his name to his letters, we ran them. Some people considered that brave. The idea was to create dialog in the virtual vacuum that was Detroit during the newspaper strike of 1995 – 2000.1Cf. James Bennett, “After 7 Weeks, Detroit Newspaper Strike Takes a Violent Turn,” New York Times, September 06, 1995, accessed April 23, 2013. ...continue We wanted to see shows reviewed, and we wanted to get feedback on those reviews. We risked offending Joy Colby, who was still writing regularly for the Detroit News. She was a good sport and a generous soul who didn’t see our operation as a critique of her efforts, but as another voice in the conversation. 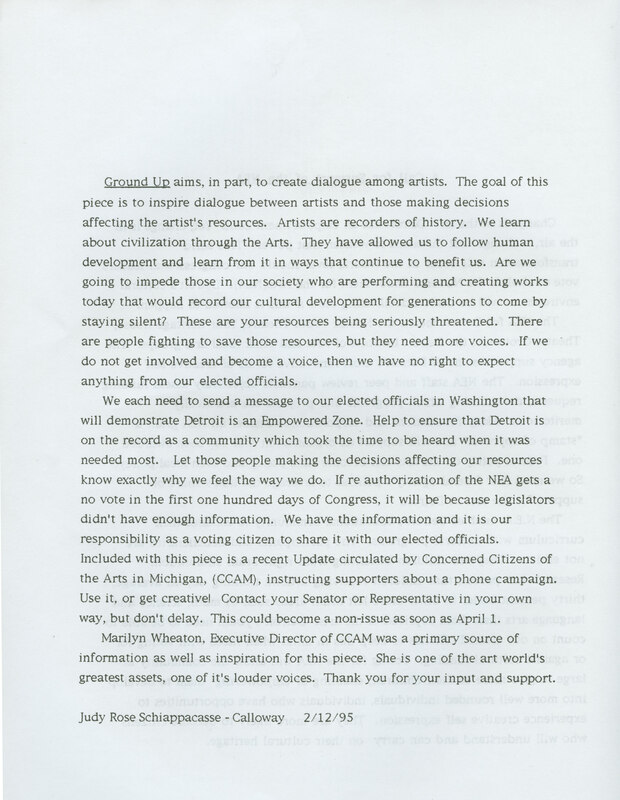 We got the attention of Jim Hart, at what was then the Detroit Council of the Arts. 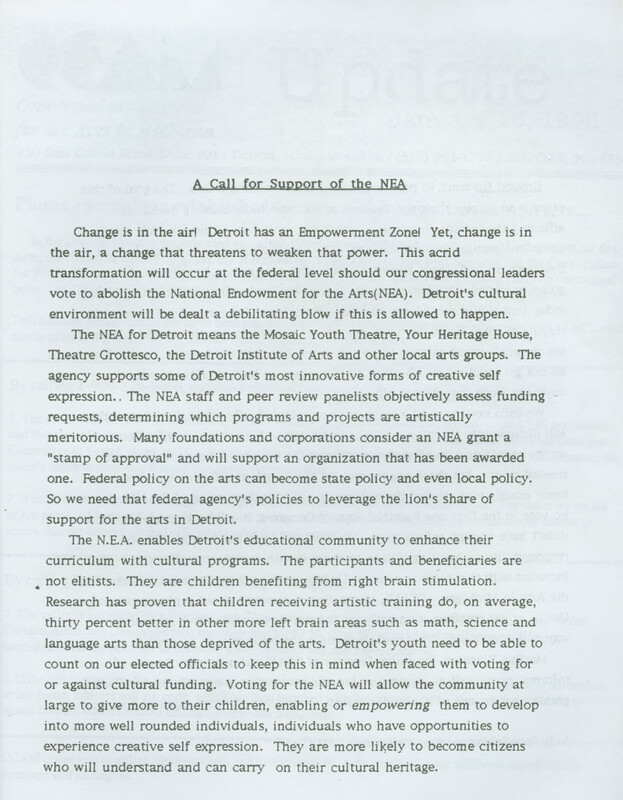 He had small pockets of money made available through MCACA [Michigan Council for Arts and Cultural Affairs], and he asked me to write a grant application to pay expenses for a couple of special issues. That was a nice little pat on the back. It was a lot of work and, in my opinion, it could always have been better. But I liked the roughness and the do-it-yourself ethic, and what I considered the heartfelt honesty. Some of the writers were more sophisticated and critically astute than others. There was always the risk of becoming just a bunch of friends patting one another on the back. There were always complaints, because this town loves nothing better than to complain about how everything falls short. Our intention was to make it a monthly. We quickly learned that it would have to be a bi-monthly effort. It became exhausting to recruit writers – everyone wants their show reviewed, and only a handful of people want to write for free. We kept it up for three years, then threw ourselves a nice party after which I put it all away in boxes. There are still multiple copies of what I think is every issue, or nearly every one, in my basement. I’ve tried a couple of times to get CCS to keep the full set on hand in the library, but I don’t know if they still have them available. By the time I was exhausted and my marriage was falling apart, Nick Sousainis was getting started with thedetroiter.com. He did a great job with that one. My fervent dream is to see somebody start an honest-to-goodness print publication – bi-monthly or quarterly – devoted to art in Detroit, where writers and editors and photographers and designers get paid for their work. I don’t know the root reasons why it’s so impossible to keep something like that funded, apart from the reasons why all print publications and newspapers are struggling to survive. I know Glen Mannisto made a heroic effort in the mid-nineties with Straits (1982-1984) and then Trait (1999), but it didn’t last.